Every month a member of the Carus team introduces his/her favorite work, whether it be a choral piece, a CD, a songbook or an instrumental work. The recommendation for October 2018 was contributed by Jan Schumacher. When I sang Beethoven’s Mass in C for the first time at the age of 18 in a school choir, I was immediately captivated by the magnificent music. 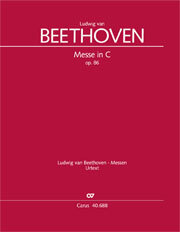 Inspired by the idea that “if that is Beethoven’s ‘little’ mass, how grandiose must the Missa solemnis then be! ?”, I bought myself a recording of the Missa solemnis straight away, listened to it immediately at home, and was stunned by it. What kind of a piece was that supposed to be? Just under ten years later I found myself having to confront the Missa solemnis again, this time rehearsing and working on sections of the piece with a choir – a choir which, to my mind, was not up to the demands of the score (but under the circumstances there was “no escape” from the project for me). My awe and even fear of the work was reinforced at the beginning of the rehearsals by the rehearsal weekend. To date it has remained the only rehearsal weekend of my entire life in which no perceptible improvement occurred between arriving on Friday and leaving on Sunday: the choir left for home on Sunday as baffled as they had arrived on Friday. But the breakthrough came in the next regular rehearsal! What had been learned at the weekend had sunk in, and suddenly the singers understood the “Et vitam” fugue! Suddenly the majestic shone through in the Kyrie! Suddenly the seemingly disparate sections of the Agnus Dei fitted together to form a whole. The concert was ultimately a success – and to this day the choir’s enthusiasm for the Missa solemnis knows no limits. These thoughts would naturally not be appearing under the heading “Favorite Works” if I had not gone on to share this enthusiasm since then. 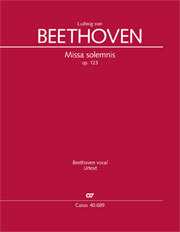 The Missa solemnis, which Beethoven himself described as his “greatest work” (and in this case this statement is absolutely credible, despite the composer’s aggressive self-promotion in his correspondence with his publishers), is a testimony to his years of wrestling with sacred music, with liturgical texts and their interpretation, and his own personal approach to faith. We feel that Beethoven was immersed in these matters in every measure. And, as with his symphonic and chamber music output, this work is completely new, but without completely upsetting the genre in music-historical terms. Rather, it is a further development and elevation of the existing. And although in his interpretation of the text, Beethoven allows the most extreme musical differences to follow on from each other in rapid succession, the work is nevertheless completely unified in itself. I once read that Beethoven had consciously composed the Missa solemnis with such high demands because faith itself (or the consideration of it?) pushes everyone to his or her limits. Beethoven wanted to make this directly perceptible for both performers and audience. 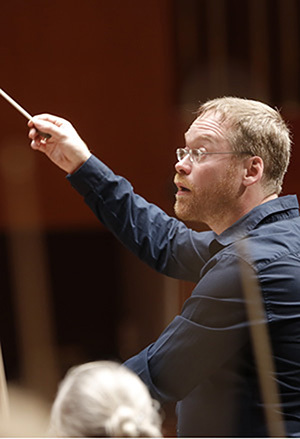 Jan Schumacher is University Music Director of the Goethe University in Frankfurt am Main and conductor of the Camerata Musica Limburg and the Chorus of the Technical University Darmstadt. With his ensembles he performs a wide repertoire ranging from Gregorian chant to premieres of new works and jazz, from symphonic orchestral repertoire to Big Band and vocal and electronic improvisation. As well as this he directs seminars for singers, orchestras, and conductors in many European countries and internationally. He ist also an editior for Carus-Verlag.